The weather didn't cooperate when we tried having this ride back in December so we're going to give it another try now. 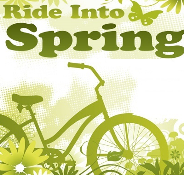 Join the Tulsa Bicycle Club for a ride from Bixby's Bentley Park to the Kiefer store returning through Glenpool. The TBC recommends downloading the map for this route to your smartphone or gps device by clicking on "Send to Device" on the map below and following the instruction from Ride with GPS.